On December 4, 2018, insights and potential solutions to address AI issues in Government will be provided by well-known experts and thought leaders in the panel session. This is a component belonging to a 3-day event in Boston – the upcoming AI World Conference and Expo 2018 and is considered the largest independent enterprise AI business event in the world, with over 100 sessions, 200 speakers and 85 sponsors and exhibitors. This session is going to be moderated by John Desmond, Editor of AI Trends, with the presence of Marc Mancher, US Government and Public Services Robotics & Intelligent Automation Lead, Deloitte Consulting LLP; Wayne Haubner, Chief Innovation Officer, Synergi Partners; Brad Mascho, Chief Artificial Intelligence Officer, NCI. 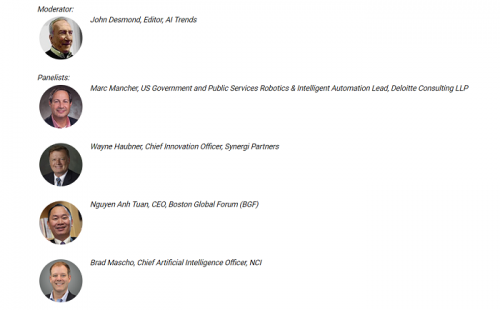 Mr. Nguyen Anh Tuan – CEO of Boston Global Forum (BGF) will also attend this panel session and share about the concepts of AI-Government, which the Michael Dukakis Institute has been developing and which belongs to the Artificial Intelligence World Society (AIWS) Model.